Special diets: Does not contain animal products. Does not contain eggs. Does not contain lactose/milk. Does not contain gelatine/ingredients from pork. Does not contain peanuts. Does not contain nuts/almonds. Does not contain soy. The best black licorice at a great price! Good quality and wonderful black licorice taste! I wish I had ten more bags of this delicious licorice. It is soooo good. I've shared this black licorice with people who generally don't like licorice, and it is always well received. A personal favorite, I love the soft texture and lingering flavor. It has good robust flavor profile and won't leave you feeling like someone watered it down. Excellent Finnish quality and purity you can trust. This is very good licorice. I normally do not like black licorice but this is wonderful. I love this licorice. It is soft and melts in your mouth. Panda's black licorice candy is for people who like the taste of genuine licorice without it being bland or over-powering. Some licorice candies are too mild, and others are too strong and salty. This one is just right. The only comparable licorice I've had is a French candy that's directly imported by a store in Los Angeles. Panda's licorice is much less expensive but of equal quality. Panda licorice is my new favorite! 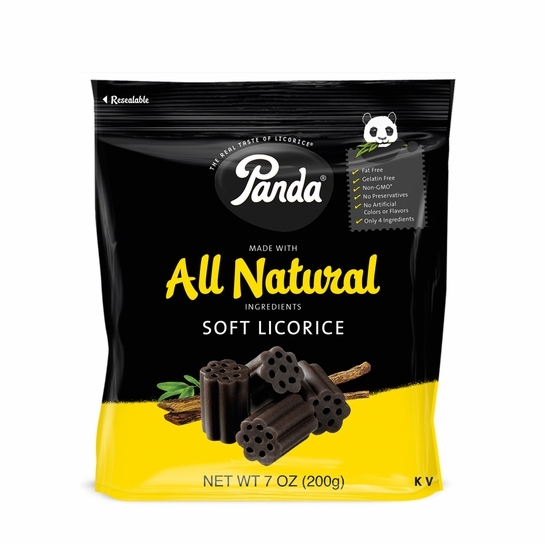 Panda Licorice is the Best! Our family uses Panda black licorice primarily to shorten the duration & severity of cold symptoms such as cough & sore throat. My husband also uses it daily to help with a chronic cough. With only four natural ingredients, you won't be eating lots of artificial ingredients. Healthy, delicious, & an effective natural medication for colds & coughs. You can't go wrong! It is very hard to find good licorice these days. Everything tastes sugary and artificial. This is the real stuff! If you are a black licorice fan you will not be disappointed. Great product with true flavor, which was perfect for adding to a Finlander's gift who is a fan of black licorice. the licorice I was used to as a child. great taste, chewy but not too sticky.